This article is about a format for storing metadata in image and audio files. For information about filename and directory structures of digital cameras, see Design rule for Camera File system. The Japan Electronic Industries Development Association (JEIDA) produced the initial definition of Exif. Version 2.1 of the specification is dated 12 June 1998. JEITA established Exif version 2.2 (a.k.a. "Exif Print"), dated 20 February 2002 and released in April 2002. Version 2.21 (with Adobe RGB support) is dated 11 July 2003, but was released in September 2003 following the release of DCF 2.0. The latest, version 2.3, released on 26 April 2010 and revised in May 2013 (and updated to 2.3.1 in 2016), was jointly formulated by JEITA and CIPA. Exif is supported by almost all camera manufacturers. The Exif tag structure is borrowed from TIFF files. On several image specific properties, there is a large overlap between the tags defined in the TIFF, Exif, TIFF/EP, and DCF standards. For descriptive metadata, there is an overlap between Exif, IPTC Information Interchange Model and XMP info, which also can be embedded in a JPEG file. The Metadata Working Group has guidelines on mapping tags between these standards. When Exif is employed for JPEG files, the Exif data are stored in one of JPEG's defined utility Application Segments, the APP1 (segment marker 0xFFE1), which in effect holds an entire TIFF file within. When Exif is employed in TIFF files (also when used as "an embedded TIFF file" mentioned earlier), the TIFF Private Tag 0x8769 defines a sub-Image File Directory (IFD) that holds the Exif specified TIFF Tags. In addition, Exif also defines a Global Positioning System sub-IFD using the TIFF Private Tag 0x8825, holding location information, and an "Interoperability IFD" specified within the Exif sub-IFD, using the Exif tag 0xA005. Formats specified in Exif standard are defined as folder structures that are based on Exif-JPEG and recording formats for memory. When these formats are used as Exif/DCF files together with the DCF specification (for better interoperability among devices of different types), their scope shall cover devices, recording media, and application software that handle them. The Exif format has standard tags for location information. As of 2014[update] many cameras and mobile phones have a built-in GPS receiver that stores the location information in the Exif header when a picture is taken. Some other cameras have a separate GPS receiver that fits into the flash connector or hot shoe. Recorded GPS data can also be added to any digital photograph on a computer, either by correlating the time stamps of the photographs with a GPS record from a hand-held GPS receiver or manually by using a map or mapping software. The process of adding geographic information to a photograph is known as geotagging. Photo-sharing communities like Panoramio, locr or Flickr equally allow their users to upload geocoded pictures or to add geolocation information online. Exif data are embedded within the image file itself. While many recent image manipulation programs recognize and preserve Exif data when writing to a modified image, this is not the case for most older programs. Many image gallery programs also recognise Exif data and optionally display it alongside the images. Software libraries, such as libexif for C and Adobe XMP Toolkit or Exiv2 for C++, Metadata Extractor for Java, PIL/Pillow for Python or ExifTool for Perl, parse Exif data from files and read/write Exif tag values. The Exif format has a number of drawbacks, mostly relating to its use of legacy file structures. The derivation of Exif from the TIFF file structure using offset pointers in the files means that data can be spread anywhere within a file, which means that software is likely to corrupt any pointers or corresponding data that it doesn't decode/encode. For this reason most image editors damage or remove the Exif metadata to some extent upon saving. The standard defines a MakerNote tag, which allows camera manufacturers to place any custom format metadata in the file. 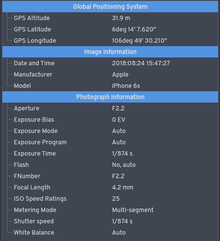 This is used increasingly by camera manufacturers to store camera settings not listed in the Exif standard, such as shooting modes, post-processing settings, serial number, focusing modes, etc. As the tag contents are proprietary and manufacturer-specific, it can be difficult to retrieve this information from an image or to properly preserve it when rewriting an image. Manufacturers can encrypt portions of the information; for example, some Nikon cameras encrypt the detailed lens data in the MakerNote data. Exif is very often used in images created by scanners, but the standard makes no provisions for any scanner-specific information. Photo manipulation software sometimes fails to update the embedded thumbnail after an editing operation, possibly causing the user to inadvertently publish compromising information. For example, someone might blank out a licence registration plate of a car (for privacy concerns), only to have the thumbnail not so updated, meaning the information is still visible. There is no way to record time-zone information along with the time, thus rendering the stored time ambiguous. However, time-zone information has been introduced recently by Exif version 2.31 (July 2016). Related tags are: "OffsetTime", "OffsetTimeOriginal" and "OffsetTimeDigitized". There is no field to record readouts of a camera's accelerometers or inertial navigation system. Such data could help to establish the relationship between the image sensor's XYZ coordinate system and the gravity vector (i.e., which way is down in this image). It could also establish relative camera positions or orientations in a sequence of photos. The DPI-value of photos is meaningless, a fictitious number, but it is required. The inclusion of this made up tag confuses both people and software. The format has not yet been updated to remove this requirement. Since the Exif tag contains metadata about the photo, it can pose a privacy problem. For example, a photo taken with a GPS-enabled camera can reveal the exact location and time it was taken, and the unique ID number of the device - this is all done by default - often without the user's knowledge. Many users may be unaware that their photos are tagged by default in this manner, or that specialist software may be required to remove the Exif tag before publishing. For example, a whistleblower, journalist or political dissident relying on the protection of anonymity to allow them to report malfeasance by a corporate entity, criminal, or government may therefore find their safety compromised by this default data collection. In December 2012, anti-virus businessman John McAfee was arrested in Guatemala while fleeing from alleged persecution in Belize, which shares a border. Vice magazine had published an exclusive interview on their website with McAfee "on the run" that included a photo of McAfee with a Vice reporter taken with a phone that had geotagged the image. The photo's metadata included GPS coordinates locating McAfee in Guatemala, and he was captured two days later. McAfee later claimed to have edited the EXIF data from his phone to provide a false location. According to documents leaked by Edward Snowden, the NSA is targeting Exif information under the XKeyscore program. The privacy problem of Exif data can be avoided by removing the Exif data using a metadata removal tool. Metadata Working Group was formed by a consortium of companies in 2006 (according to their web page) or 2007 (as stated in their own press release). Version 2.0 of the specification was released in November 2010, giving recommendations concerning the use of Exif, IPTC and XMP metadata in images. Extensible Metadata Platform (XMP) is an ISO standard, originally created by Adobe Systems Inc., for the creation, processing and interchange of standardized and custom metadata for digital documents and data sets. IPTC was developed in the early 1990s by the International Press Telecommunications Council (IPTC) to expedite the international exchange of news among newspapers and news agencies. The following table shows Exif data for a photo made with a typical digital camera. Notice that authorship and copyright information is generally not provided in the camera's output, so it must be filled in during later stages of processing. Some programs, such as Canon's Digital Photo Professional, allow the name of the owner to be added to the camera itself. Unfortunately, the proprietary formats used by many manufacturers break if the MakerNote tag is moved, i.e. by inserting or editing a tag that precedes it. The reason to edit to the Exif data could be as simple as to add copyright information, an Exif comment, etc. In some cases, camera vendors also store important information only in proprietary makernote fields, instead of using available Exif standard tags. An example for this is Nikon's ISO speed settings tag. ^ "Standard of the Camera & Imaging Products Association, CIPA DC-008-Translation-2012, Exchangeable image file format for digital still cameras: Exif Version 2.3" (PDF). Retrieved 2014-04-08. ^ Technical Standardization Committee on AV & IT Storage Systems and Equipment (April 2002). "Exchangeable Image File Format for Digital Still Cameras" (PDF). Version 2.2. Japan Electronics and Information Technology Industries Association. JEITA CP-3451. Retrieved 2008-01-28. ^ a b "Guidelines for Handling Image Metadata" (PDF). Metadata Working group. 2010-11-01. Retrieved 2015-05-11. ^ "The libexif C EXIF for C". Retrieved 2009-11-08. ^ "Adobe XMP Toolkit SDK". Adobe Inc.
^ "Exiv2 Image Metadata Library". Andreas Huggel. Retrieved 2009-02-12. ^ "Metadata Extractor". Drew Noakes. Retrieved 2011-02-18. ^ "Image::ExifTool Perl library". Phil Harvey. Retrieved 2009-02-12. ^ "TIFF Revision 6.0" (PDF). Adobe. 1992-06-03. Archived from the original (PDF) on 2012-06-25. Retrieved 2009-04-07. ^ "Nikon Tags: Nikon LensData01 Tags". Phil Harvey. 2008-01-25. Retrieved 2008-01-28. ^ Maximillian Dornseif (2004-12-17). "EXIF Thumbnail in JPEG images". disLEXia 3000 blog. Archived from the original on September 28, 2007. Retrieved 2008-01-28. ^ "Multi-Picture Format" (PDF). CIPA. 2009-02-04. Retrieved 2014-04-29. ^ "McAfee wins stay of deportation from Guatemala". Cnn.com. Retrieved 2012-12-26. ^ Alex Wilhelm (3 December 2012). "In fresh twist, John McAfee now claims he falsified the metadata of the photo that placed him in Guatemala". The Next Web. Retrieved 5 November 2018. ^ Staff (July 31, 2013). "XKeyscore Presentation from 2008 – Read in Full – Training Materials for the XKeyscore Program Detail How Analysts Can Use It and Other Systems to Mine Enormous Agency Databases and Develop Intelligence from the Web – Revealed: NSA Program That Collects 'Nearly Everything a User Does on the Internet'". The Guardian. Retrieved August 6, 2013. ^ Hassan, Nihad, and Hijazi, Rami. Digital Privacy and Security Using Windows: A Practical Guide. Apress, 2017, pp. 57-59. ^ "JPEG Rotation and EXIF Orientation / Digital Cameras with Orientation Sensors etc". Impulseadventure.com. Retrieved 2012-12-26. ^ (JEITA CP-3451) Section 4.7.2: Interoperability Structure of APP2 in Compressed Data. ^ Phil Harvey (18 March 2011). "FlashPix Tags". Retrieved 29 March 2011. ^ (JEITA CP-3451) Section 5: Exif Audio File Specification. ^ Evan Hunter. "EXIF Makernotes - Reference Information". OZHiker. Retrieved 2008-01-29. ^ "Exif MakerNote 解析カイセキ情報" (in Japanese). Kamisaka. Retrieved 2008-01-29. ^ "SIGMA and FOVEON EXIF MakerNote Documentation". x3f.info. Archived from the original on 2007-08-05. Retrieved 2008-03-26. ^ "ExifTool Tag Names". Phil Harvey. 2008-01-18. Retrieved 2011-01-24. ^ "Olympus Makernotes" (in German). Olypedia. Retrieved 2008-01-29. ^ Andreas Huggel (2012-04-25). "Makernote formats and specifications". Retrieved 2012-09-09. Wikimedia Commons has media related to Exif. This page was last edited on 12 March 2019, at 11:26 (UTC).